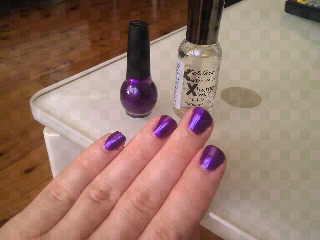 3 coats of Nicole by OPI in "Prized Possession" followed by 1 coat of Sally Hansen Xtreme Wear in "Invisible"
Oh loving the purple polish! Gorgeous! Thanks Lauren. I love the colour too. Except the formula is quite thin so I had to do 3-4 coats :( So it took agggges to dry.